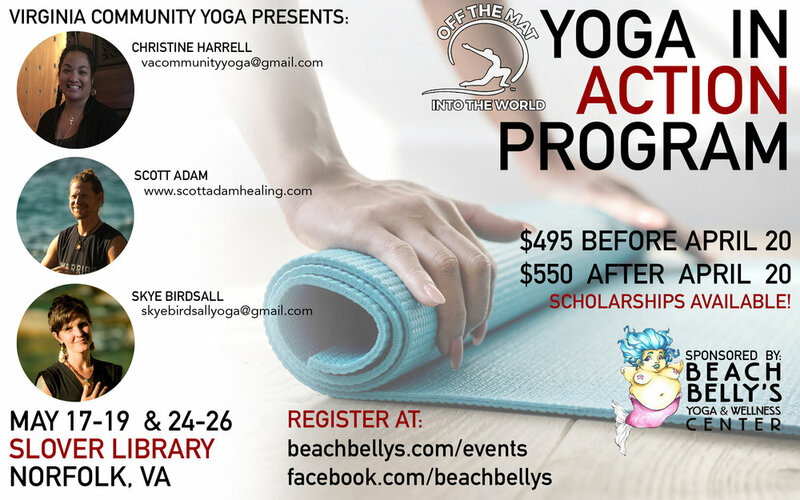 Please join Skye Birdsall and Scott Adam from Nevada City, CA and Christine Harrell, the Executive Director of Virginia Community Yoga in this 40 hour Off the Mat and Into the World, Yoga In Action program sponsored by Beach Belly’s Yoga and Wellness Center. Yoga In Action (YIA) is a grassroots, purpose- driven leadership program that brings the Off the Mat (OTM) experience of self-inquiry and sustainable action to a local level. Designed as a small circle model, this 40 hour program is an opportunity to build community around yoga and service, to develop relationships with other yogis and activists, and to collaborate on creating authentic and lasting change close to home. In this training, with the support of a small group of peers, participants journey from inward witnessing and acceptance to outward purposeful and accountable action within their communities and the outside world. Off The Mat's (OTM) vision is to seed these small groups of change in communities and online to inspire collaboration and connection among our diverse community of activists. Over the last ten years, through this 5-day Yoga, Purpose & Action Intensive, OTM has trained hundreds of leaders across the glove to lead YIA Circles on a local level and has ultimately built a network of embodied, inspired, an motivated people, committed to actively serving their communities in a conscious and sustainable way. (Off The Mat founders, Seane Corn, Hala Khouri and Suzanne Sterling. This program was mad possible by a generous donation from Beach Belly’s Yoga and Wellness Center. Please check out their website for more information on how BBY is supporting the local community through yoga and wellness. Christine Harrell is a certified 500/hr CE-RYT from National Yoga Academy and is a certified Ayurveda Wellness Lifestyle Counselor. She is a Childlight Yoga Instructor and a graduate of the Wise Earth Ayurvedic School with a certification in Ahimsa Japa Meditation. Christine is also a trained birth and postpartum doula and enjoys guiding pre-natal and postnatal mothers and babies in yoga. She is a certified Prison Yoga Project teacher, taught by the founder of the Prison Yoga Project, James Fox M.A. Christine is the Executive Director of the Virginia Community Yoga Jail Project in Hampton Roads, VA in which she teaches Yoga, Mindfulness Meditation, and Non-Violent Communication (NVC) in the local jails in hopes to pursue to the prisons. She has expanded her knowledge in yoga by training in Trauma Informed yoga and becoming a Prison Mindfulness Meditation teacher. Scott Adam has been a yogi since the early 1990’s when he started studying in college at the American Academy of Dramatic Arts. Since then he took his yoga skills into the professional snowboarding field as a coach and incorporated yoga into his training sessions with his team. He moved to Lake Tahoe, CA in 2014 after leaving his snowboard career and worked for Wanderlust Festivals for a few years. He then studied to be certified as a 200HR RYT and began teaching weekly classes full time. In 2016 he produced the yoga and music festival Conscious San Jose which focused on serving those who experience homelessness in the downtown area. Playing music and performing was always a big part of Scott’s life and the deeper he went into yoga and healing arts he discovered a gift and passion for sound healing. He now offers powerful sound healing journeys in the greater Lake Tahoe area and the SF Bay Area. His big heart of service leads the way to making the world a better place. Skye Birdsall began her yoga journey as a teen and has been teaching since 2010. After giving birth to her daughter in 2008 she realized her passion and calling to be a healer and teach in the healing arts. Her background and passion for music led her to study Bhakti Yoga and begin playing harmonium for her students. Skye has taught many styles of Hatha Yoga but now focuses on therapeutic forms of yoga for healing from trauma, illness and injury. This passion led her to teach for the Veteran’s Affairs Hospital in Palo Alto for an addiction and recovery program. She now writes articles for yoga studios and is a guest teacher in a 300HR teacher training program in San Jose. Her mission is to support as many souls as possible to awaken and realize the healing power within.